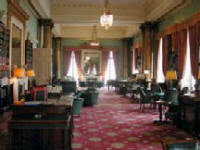 The Athenaeum is a gentlemans club standing on the corner of Pall Mall and Waterloo Place. It is noted for its large library and for the bas-frelief freize copied from the Elgin Marbles decorating the club house exterior. Over the entrance is a gold figure of Pallas Athena, Goddess of Wisdom. It was long regarded as a clergyman's club and boasts bishops, cabinet members, peers, lawyers and academics among its members. A notable feature of the club's clock which hangs above the stairs is that it has two figure sevens and no figure eight. The Athenaeum stands on the corner of Pall Mall and Waterloo Place. The entrance is in Waterloo Place. By bus: a one-way system is in operation in the area. Coming from Trafalgar Square direction :buses 6, 9, 13,15, 23 &159 all go down Pall Mall. There is a stop in Pall Mall. Coming from Piccadilly Circus direction: buses 3, 6,12, 13, 88 & 23 go down Haymarket. Get off in Haymarket, walk down (away from Piccadilly) to the bottom of the street and turn right into Pall Mall. The Athenaeum is on the left at the junction with Waterloo Place. Entrance in Waterloo Place. By underground: The nearest stations are Piccadilly Circus (Piccadilly and Bakerloo lines) and Charing Cross (Bakerloo and Northern lines). Check for possible engineering works. By car: the nearest NCP car park is at 18 Arlington Street, off Piccadilly near the Ritz. Contact phone: 020 7499 3312.